Sometimes the heat of the grill just isn’t enough to keep all your guests warm, especially on cooler evenings. Maybe your al fresco dining doesn’t even involve a grill, just an excuse to show off your new deck or pool? Central heating for your garden isn’t an option, so how are you going to keep everyone warm as those chilly nights draw in? Fire pits have become increasingly popular across the USA, and people huddled around one in the backyard is now a common sight. The American Society of Landscape Architects reports outdoor fire pits are the number one requested design feature today. They will add both ambiance and warmth to your outdoor gatherings. Many states now have restrictions on wood-burning fires, so gas fire pits offer a viable alternative. Decorative logs, glass beads or rocks can be just as attractive, and the gas burner will be safer too – no sparks. Join us as we take a look into the world of the best gas fire pits, and why you might want to add one to your autumn soirées. In this article, we take a detailed look at what a gas fire pit is, the benefits of them compared to fires using other fuels, what to look for and what to avoid when shopping for one, and end with a list of our top choices for the best gas fire pit available today. Benefits of Gas Over Wood Burning Fire Pits? A gas fire pit is a decorative feature, traditionally found in your garden or backyard to provide warmth. Although the word “pit” suggests a large hole in the ground, many modern gas fire pits are free-standing constructions. Some designs can be recessed into the ground, which provides protection from the flames. Portable gas fire pits resemble the propane burners used at Thanksgiving for deep frying the turkey. A round metal construction uses a concave bowl or basket with a burner at the base connected by a hose to a propane tank. Ideal for sitting around as a campfire, they are a common choice for the backyard being easy to move to where needed most. Traditional gas fire pits will usually be made of either metal or stone. They can also take the form of a masonry feature or a table that you can sit around with guests. A chamber under the pit will normally house the propane tank, although many can be linked to a natural gas pipeline. Gas fire pits offer the ultimate in convenience for homeowners. They are much quicker to light than wood fires and don’t need constant refueling. Quickstart ignition systems found on modern gas fire pits, ensure you can light them instantly. As quick as they are to start up, they can also turn off quickly, for safety and energy saving. Gas fire pits are less messy to use, with no wood to be handled and no clearing up. If you’re camping, you no longer have to waste time collecting firewood. At home, just make sure you have gas, either natural or liquid propane. They also offer a safer heat form, with no unpredictable sparks. Therefore, they are ideal for use on the deck. Furthermore, If you live in an area which prohibits the burning of wood, a gas fire pit is a simple solution. Both natural gas and liquid propane are clean-burning fuels, ideal for those with allergies or smoke sensitivities. That clean-burning propane or natural gas can also be one of the biggest downfalls of a gas fire pit. If you choose a propane model, there’s always the chance it could run out mid-party. Also, with natural gas, once the line has been laid, you won’t find it easy to move the fire pit. Gas lines can be expensive to install, so portability is limited compared to wood fired or coal options. Many people would argue you lose the romance of a campfire when using gas instead of wood. You can, however, obtain decorative, often ceramic, logs, which add to the visual appeal. Other models may use rocks or colored glass pebbles for a decorative effect. Finally, if cooking over your fire pit, you lose the depth of flavor that you get with wood or charcoal-burning pits. Nothing compares to that BBQ taste you only get with those grills. Most gas fire pits haven’t been designed with cooking in mind, however, and you will probably need to buy a separate grate or rotisserie. Not all gas fire pits are created equal. Design, build quality and features can vary greatly between different models. Her’es what you want to look for when choosing the best models to fit your needs. Gas fire pits come in many shapes and sizes. The design and style can simply be a choice of elegance or function. If it’s to be used in your backyard, will it also be pleasing to the eye, as well as an effective source of heat? Semi-permanent gas fire pits will normally be made from metal or stone. Faux-brick or a wooden effect finish can be used to make the metal casings more attractive. Those styled as a table look elegant and provide extra table space when entertaining. Plus, they keep the gas bottle hidden away and safe. Portable propane gas fire pits are ideal for moving around your yard or patio, and can easily be taken on camping weekends. If you intend to use the fire pit on the go, ensure you choose one which is both compact and lightweight. Remember though that you will have to fit a gas propane tank in the trunk, too. Gas is the safe choice over wood as a fuel, being less likely to result in a campsite or forest fire. Some campsites, however, may have a complete ban on all open fires. Check their regulations before you light anything up! With the NFPA reporting over 3000 bush and grass fires caused by fire pits or outdoor fireplaces, you can understand why they’re so cautious. When you wander into a hardware store or search online for a gas fire pit, you will be bombarded with the number of BTUs each pit offers. The BTU, or British thermal unit, is a measurement of how much gas you use, but also usually means a higher heat output. As a reference point, high-end grills will feature burners around the 25,000 BTU mark. For a gas fire pit, 40,000 BTUs or more is a good starting point. Gas fire pits need to heat a larger area, but you don’t want to toast your guests. If you are more familiar with kilowatts per hour as a heat measurement, you can convert BTUs by using the following conversion table and calculator. The next thing to consider is how you want to ignite or turn on your gas fire pit. The ignition can affect both convenience and safety. There are, in general, three different ignition systems to choose from. Let’s take a look at each in turn. The most basic form of ignition tends to be the old-fashioned match system, found on many of the less expensive burners. A gas shut-off valve is manually controlled with a key, which allows gas to flow to the burner. You then manually light the burner with a match, or some form of oven lighter, simply turning off the valve when finished. A more modern system is the spark, or piezo ignition system, similar to those found on many gas grills. A small push button will send a manual spark to the surface of your burner, which ignites the gas. Normally only found on high-end gas fire pits, an electronic ignition allows for an easy flick of a switch. Some can even be operated by remote control for convenience. Many electric ignitions use battery power, eliminating the need for an external power source. As fire pits have become more popular, unfortunately, so have the number of injuries caused by them. At least 5,300 injuries related to fire pits or other outdoor heaters were treated at emergency rooms across the US in 2017. According to the Consumer Products Safety Commission, that’s nearly three times the amount of reported injuries in 2008. You should always check that your gas fire pit has been certified as safe by an independent product safety certification company, like Underwriters Laboratories. A “UL” listing can assure you that your equipment will withstand outdoor elements and other potential dangers. Furthermore, the Canadian Standards Association and the American National Standards Institute have a harmonized standard, which fire pits must meet. An emergency shut-off valve should always be found on the burner, or at least the hose going to the burner. If the burner uses external propane tanks, ensure the hose is long enough for safe storage of the tank. If the fire pit is designed to be filled with decorative logs, ensure there is a mesh covering to prevent blocking the nozzles. The size of the burner ring will determine what size propane tank you need. Many manufacturers will specify a standard 20-pound tank, with the largest compatible ring being 20 inches in diameter. Larger rings will need more gas supply, from a larger tank or natural gas. If you want a flame that burns brighter and can be seen even in daylight, liquid propane is your best choice. There are none of the installation costs associated with natural gas, as you don’t have to hire a certified gas installer. 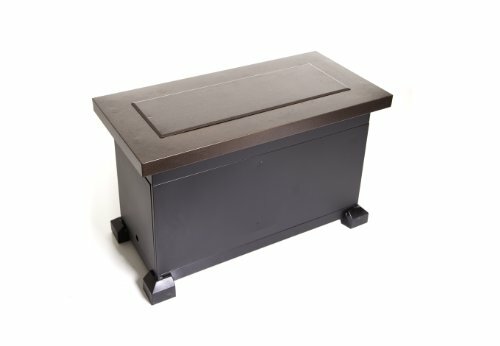 An LP tank also gives you more freedom to move the fire pit or table around with ease. If your gas fire pit is going to be a year-round feature which stays out in your garden, look for long lasting materials. Stone can be very durable for the exterior, but a cover could help protect the burner and any other exterior metal parts. A good quality cover will also allow you to use the fire pit as a table when the fire is not lit. Steel or stainless steel will tend to last longer and offer more protection from the elements. The interior section closest to the flame should be made of a good quality heat-resistant metal, like porcelain, aluminum or steel. Most gas fire pits will come with a standard one-year parts and service warranty. Providing it’s been installed and used correctly, the manufacturer will service any faults under warranty. You can often contact the manufacturer directly to check if the burner unit has an extended warranty available. It’s no surprise that some gas fire pits can get very expensive. But there are plenty of smaller, more affordable models available, which still offer the convenience of gas. It just depends on what you are looking for. Are you looking for something your family and friends can gather around at home? Or do you need a portable product for other outdoor adventures? Portable fire pits will offer better value and more versatility. There’s no stopping you from setting it up on your deck at home. Models that use natural gas are usually more expensive, although many propane models can be converted. As you are less likely to be moving a natural gas fire pit, it may be worth spending that little extra for one that is more durable. Installation of a gas line can also be expensive, although natural gas is likely to be much cheaper than propane refills in the long run. Steer clear of cheaper products which use less robust materials, especially if it’s to be left outdoors. At the very least, you will want a quality stainless steel burner which won’t rust or corrode and become a danger. Avoid burner units which don’t feature a stable footing. Pets or children can often trip or knock over an unstable fire pit. If it’s is going to be used on your new decking, or outdoors when camping, avoid those with metal legs that might conduct heat. Following is a list we’ve compiled of some top contenders for the best gas fire pit available today. We’ve made sure to include something for every need and budget, and go into detail on what we like about each unit, and who they are best suited to depending on needs and desires. Having played around with chimeneas in the past, I was looking for something more compact. Something I could easily put in my trunk for a weekend fishing trip or late-night football game. A portable gas fire pit like this one from Heininger would be ideal. It’s even pretty enough for my wife to allow it on the patio. For something a little bit fancier than your average fire pit, the Heininger boasts a gorgeous copper/bronze color. The design features of this portable product would look just as good at home, on an elegant patio or deck. Inside the box, you will find the Heininger 5995 fire bowl, a 10-foot propane hose, propane stabilizer ring and a set of decorative rocks. With everything except a tank in the box, it’s ready to hook up to your nearest tank, for instant warmth. At just 22 pounds in weight, the Heininger is very easy to pick up and carry to your campsite. With a 19-inch diameter bowl and standing just over a foot tall, it’s easy to store or place in the trunk of your car. The light weight makes it ideal for moving around your yard when the party moves away from the house. It’s just as easy to carry in your arms for an impromptu party down the street. This model from Heininger uses a manual ignition. You will need to carry a box of matches or lighter when using this fire pit. However, a gas regulator allows you to control the flow of gas easily, to avoid flare-ups as you ignite. 58,000 BTUs provides plenty of heat for keeping you nice and toasty. The smaller 19-inch diameter of the ring may, however, struggle to keep a whole patio of guests warm. You would probably need a few of these for that task. A smokeless flame is ideal for those areas which forbid fires. This gas fire pit has even been designated as safe by RV campgrounds across the states. We really like the bright flame it burns with, as a warning to any kids or animals who may be nearby. As a bonus, the pit’s metal base ring won’t get hot and scorch your garden or burn the patio. When turned off, you won’t need to wait long before storing it away. A 20-pound propane tank will last eight to 12 hours, depending on the flame setting you use. Stunning bronze and copper design. Compact enough to stow in your trunk. Sturdy stand also doubles as a handle. Metal base ring doesn’t get hot. The 10-foot hose allows propane tank to be tucked safely away. Manual ignition can be a chore. Some users report the flames don’t burn as high as seen on pictures. A tight-fitting lid for transportation costs extra. Maybe you just want to sit outside with your loved one enjoying a chilled glass of wine. 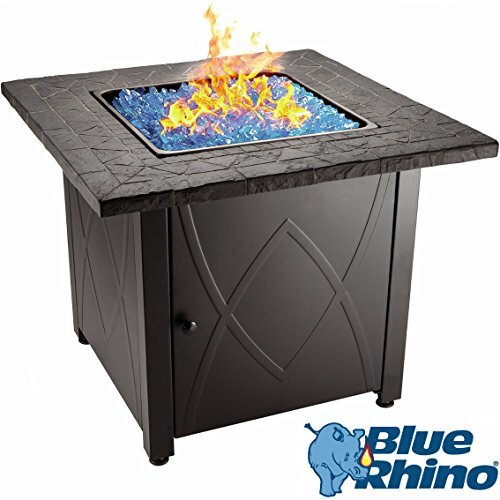 A fire pit like this Blue Rhino table is ideal for making sure the wine is the only thing that is chilled. The Blue Rhino arrives requiring assembly. Although it may look like a big job, clear instructions are provided, along with all the tools and screws you will need. Essentially, you are only putting together the bottom stand, which generally takes less than an hour. The top portion is made of one large slate piece, with the burner plate going in the middle. A gas hose is attached to the burner of the table and includes a dial, which you push to ignite the fire pit. The bottom part of the table is made of steel, not stainless steel, with a slate top. Although it will hide and protect the propane tank, steel will rust, and the slate can wear down and break away. The included plastic cover should be put over the whole table unit if you plan on keeping it outside. Square black steel fire bowl. Solid steel panels that cover a 20-pound propane tank (not included). Twelve pounds of fire glass included. Table dimensions: 30 inches by 30 inches by 24 inches. At 70 pounds, this table is not designed to be a portable fire pit. With a 20-pound propane tank inside, it will be even heavier, with no wheels on the unit for mobility. Under the top burner plate, stowed away in the propane tank storage compartment, is a safety valve and piezo ignition. Switching the fire pit on is as easy as just turning the dial and pressing in the dial to ignite. At least it should be – some owners have reported the piezo ignition sometimes fails to light and requires manual lighting with matches. This product is more about the looks than the warmth it offers. Although the blue glass gives a nice glow to the flames, it doesn’t increase the heat offered. Only 30,000 BTUs may be enough to keep a couple of you warm but won’t cover much of an area away from the table. A safety valve ensures the user is in full control and offers protection in the event of a breakdown. The piezo ignition system can be safer when it’s working correctly. The under-table compartment will easily house one standard 20-pound propane tank. Unit height of 24 inches is ideal to have a nice view of the table. Blue fire glass beads produce smooth, beautiful flame accents. Easy to operate, even if you have to light manually. Ugly propane tank is completely hidden. Included plastic waterproof cover protects from the elements. Warmth doesn’t have too much reach. No cover for just the burner, which would enable use as a table. Fall is a great time to go camping, the changing colors of nature can be quite striking. However, as many areas now have campfire bans, how are you meant to keep warm? 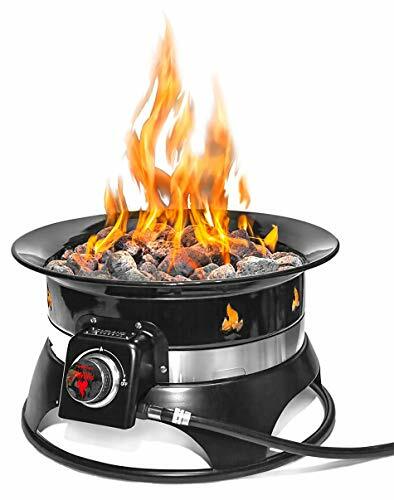 This compact fire bowl from Outland offers a safe to use, spark-free propane campfire, which is compact for easy transportation. A complete fire pit comes in the box, including a locking lid and strap with a handle for easy transportation. The 19-inch bowl is made of a durable, high-quality steel with protective enamel finish for longevity. A superior stainless-steel burner and fasteners will provide some rust-proofing. A 10-foot hose is fitted with a fully adjustable valve, and a chrome knob for altering the flame height. The fire bowl is CSA approved, for use with the 4.4-pound lava rock set, which is provided to enhance the flickering flame effect. Dimensions: 19 inches by 19 inches by 11 inches. Includes cover and carry kit. Natural gas conversion kit (CSA approved) available. At 24.5 pounds, this fire pit has been designed to be ultra-portable. The included handle uses fasteners that wrap around the entire thing for easier carrying. The locking lid ensures none of the lava rocks escape mid-trip. It comes with a matchless, piezo twist-and-start ignition system. Once it has been lit, you can adjust how large or small you want the flames to be. With 58,000 BTUs of heating power, the heat output of this fire pit is excellent, especially when you use it at the highest setting. You could quite easily feel the warmth from it when standing eight to 10 feet away. To get even more people around the warmth, you could consider one with an even larger diameter. The Outland 883 Mega Outdoor Propane Gas Fire Pit features a 24-inch diameter bowl, with 75 percent more surface area. Another quality product from Outland, you could easily get another three or four people around the pit. Like other portable fire pits we’ve looked at, the Outland 870 features a 10-foot hose as standard. Keeping your propane tank as far away as possible from the flames is one of the biggest safety precautions you can take. A natural gas conversion kit is available as an extra purchase, for safely connecting to a mains gas line. The hose supplied as standard is designed to be used with a 20-pound propane tank. Lightweight and portable, including a lid and carry kit. Superior heat output and low height allow you to feel the heat more. Quality steel construction with sleek black enamel finish. Lava rocks enhance a flickering effect. Easy to light manual ignition. Enamel coating can chip easily. Exposed steel could rust easily. The Outland range of portable gas fire pits is a popular choice among the outdoor adventure community. However, that doesn’t mean they are just limited to the campers among us, they give out enough heat for gatherings on your deck too. It’s not all about the camping, sometimes you just want a gas fire pit which fits the style of your backyard. No fancy glass, no wooden aluminum effects, only a stone finish which blends perfectly on your patio. The Crawford gas fire pit from Christopher Knight Home furniture will look as if it has been built specifically for your home. Supplied in just one piece, no assembly is required. The square base, which stores the propane tanks, has been constructed from blocks of bricks made with steel and magnesium oxide. The top and bottom of this stylish pit have been streamlined with grey steel, for added elegance. At the middle of the pit is a burner, covered with lava rocks for added effect. A smart control panel lies on the exterior, underneath the top surface, with full instructions. 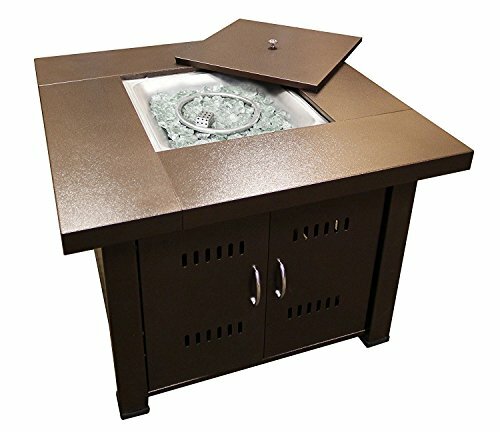 Included in the box is the gas fire pit construction, including hose and regulator attachments, and a waterproof table cover. Dimensions: 32 inches by 32 inches by 24 inches. Materials used: magnesium oxide and steel. At 162 pounds, this isn’t a gas fire pit you’re going to be moving about too often. One-year manufacturer’s warranty included as standard. A battery-operated, push button, electric ignition system is easy to use and reliable. Next to the ignition button, a large chrome-plated knob allows you to control the intensity of heat and size of the flame. With 40,000 BTUs, this decorative fire pit table will definitely keep those seated around it warm. At two feet high, the heat will dissipate in surrounding areas but won’t be too far-reaching. You certainly won’t heat the full patio area with only one of these attractive units. Both the ignition and control valve are easy to reach, on the outside of the brick construction. It’s much quicker than having to open a hidden door every time you need to alter the flame or heat setting. Full printed instructions on the control plate, in English and French, ensure safe operation at all times. The under burner storage compartment is a snug fit for a 20-pound propane tank. Heat output of 40,000 BTUs. Can run for up to 20 hours on a single propane tank. Attractive design will enhance any traditional patio. Easy to use, with full instructions on the side of the pit. No windshield, with flames being easily pushed over. Limited heating range, which only reaches smaller places. Cover provided is for full construction – no table top cover for use as a table when unlit. 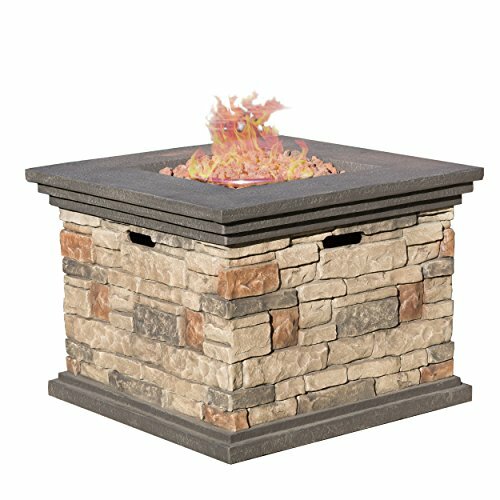 For that home-built look, this gas fire pit from Christopher Knight Home is ideal, and it comes already assembled. An intuitive design made from durable materials offers an excellent heating output for guests seated around it. Packing a separate table and a gas fire pit into the back of your RV can be cumbersome, and that’s where this 2-in-1 product may be ideal for those weekends away, and doesn’t weigh too much either. A stylish coffee table by day, heat warming pit by night. Provided unassembled, easy-to-follow instructions allow for simple construction. An access door enables the propane tank to be stowed away in the table. A burner pit is supplied with an attached hose and regulator. The included black fire glass provides a beautiful flame, with a glowing “bed of ashes” effect. Also included in the box is a top piece which uses the same penny vein coated steel, to enable the product’s use as a coffee table. The small rectangular footprint is ideal for placing alongside a sofa. Overall dimensions: 40 inches by 19.5 inches by 24 inches. Powder coated steel with penny vein finished top. At nearly 70 pounds, this isn’t a “pick up and go” portable gas fire pit. Although, it’s not too heavy or large to put in the back of your truck for a camping weekend or store in the RV. Welded metal legs, rather than wheels on the base can make it harder to move around. A matchless, push-and-turn piezo ignition is easy and safe to use. 40,000 BTUs will easily keep guests warm when sat around the table. 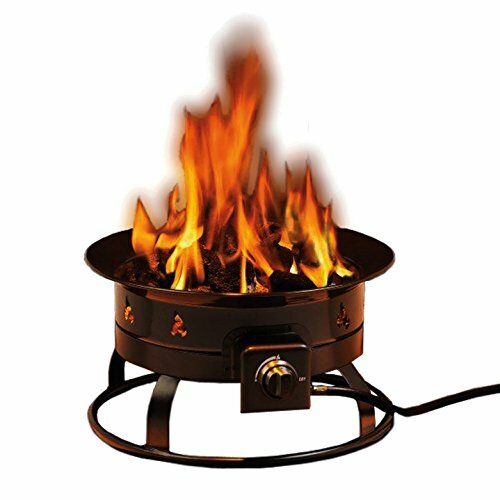 The matchless ignition and safety shut-off valve ensure the fire pit is both practical and easy to use. Legs on the base of the unit make the table safe to use on wooden deckings or grass. The compartment under the table provides ample storage for a 20-pound propane tank. Camp Chef can also supply as, or convert this table to, a natural gas model at their warehouse. Wooden style finish makes an attractive centerpiece. Ideal size for placing in front of an outdoor sofa. Table insert allows it to be used as a table, and offers space for drinks when unlit. Easy to light matchless ignition, with fully adjustable heat control knob. Table insert cover isn’t waterproof, so definitely invest in a cover if the feature is to be left outside. Lightweight metal used can dent easily. Not easily moved, with legs instead of wheels. A small and compact design, the Camp Chef Monterey can be used either on your patio or that next weekend camping trip. The versatility offered by the table insert which covers the fire pit means you are getting a beautiful piece of outdoor furniture too. Click here to find out more about this slimline and compact product. Finding something that matches your patio can often be hard. The antique bronze finish of this gas fire pit table will look elegant on almost any outdoor deck or patio. A matching table top cover turns it into an attractive table when not being used as a heat source. New and improved “ISTA 3A certified packaging” ensures this kit arrives in a safe and secure delivery. Assembly takes about one hour, with all tools provided, although a socket set could speed things up. A 30-inch table top attaches to a sturdy base unit, all made with an elegant bronze-colored steel. Easy access doors open to a compartment which stores a standard propane tank and the integrated piezo ignition system, with an adjustable flame control knob. Also included in the box are clear chunks of fire glass, to cover the burner. A provided cover features the same bronze-styled steel. 38-inch square table top, 28 inches tall. Antique bronze effect steel construction. Thermocouple flame failure device fitted. Includes matching steel cover for use as a table. At over 100 pounds, this fire pit table is designed as a semi-permanent feature. A lack of wheels makes it hard to move when the propane tank is stored in the under-counter compartment. A battery-operated pulse ignition system is easy to use. 40,000 BTUs of heat are delivered to a 15-foot diameter. CSA approved, the burner features a thermocouple failure device for maximum safety. Space is provided for a 20-pound tank of liquid propane. Easy access door for stowing propane tank. Insert table top cover included. Not all-weather or stain resistant. No stand cover provided, so steel may rust quickly. This outdoor propane fire pit features a bronze finish which can complement any outdoor patio furniture. The matching cover enables the use of an elegant table in the warmer summer months, or a fire pit when fall arrives. Added clear fire glass ensures it looks warm too. Sometimes it seems like there is an endless choice for high-end gas fire pit tables to keep you warm on the patio. Unfortunately, many of them come at a high-end price too. This outdoors propane fire pit offers a tasteful alternative at a budget price. The Bali Outdoors gas fire pit arrives securely packaged in the box, with full detailed assembly instructions. Easy to assemble, it comes with all the tools and parts you need to get it up and running. The box also includes a set of lava rocks, giving a more elegant look and a great heat insulator. It features a modern look with a matte black finished steel construction. Distressed edges offer a rustic look, with a spacious cabinet that will hold the propane tank and other accessories. Unfortunately, no cover is provided as standard. 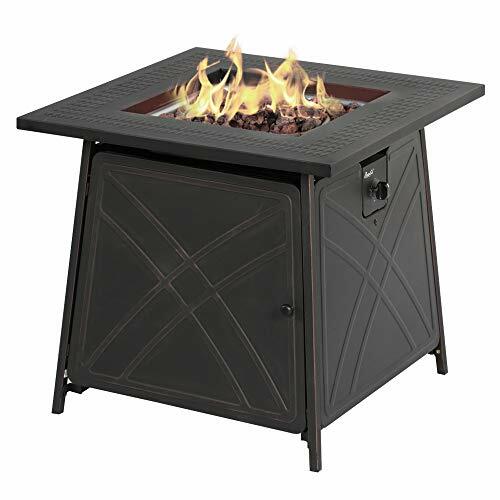 25 inches tall, with a 28-inch wide square gas fire pit table top. All steel construction, stainless steel burner. At 70 pounds, this table style fire pit is not designed as a portable unit. With no wheels, moving it can be difficult, especially when it contains the propane tank. A hidden control panel features a battery-operated electronic ignition and a safety valve for easy lighting. 50,000 BTUs provide more heat than many similar gas fire pit tables with lower rated burners. The lava rocks act as insulation and can help maintain the heat at lower settings, for more efficient gas consumption. You could add fire glass for extra ambiance, which also helps reflect the heat. With the tank tucked away in the spacious cabinet below, there’s less chance of anyone tripping over the hose. Although, if you have younger children the flame has no protection features, with the table at a potentially dangerous height for kids. The compartment has enough space for a 20-pound propane tank, while still allowing plenty of airflow. You could even fit a spare tank in the compartment, too. Hidden control panel improves aesthetics but is easy to reach. Electronic ignition and safety valve. Powerful 50,000 BTU stainless steel burners. Lava rocks add flame effect and heat insulation. Tabletop cover insert must be purchased as extra. No protection from flames for younger children. Steel will rust if left uncovered in the elements. For the more modern backyard, this contemporary gas fire pit can add ambiance and warmth to any gathering. A smaller pit opening on the top of the square table top allows for higher flames. How Long Does a Gas Fire Pit Last? Most gas fire pits which use a standard 20-pound propane tank will give up to 12 hours of warmth. Obviously, the higher the BTUs of the burner, the more gas it will consume. Using your burner at the highest flame setting will also reduce the runtime, with some 50,000+ BTU burners only lasting four hours at higher settings. How Many Btus do I Need for a Gas Fire Pit? More BTUs naturally means more heating power. But how many BTUs you actually need depends on both the size of your burner and the type of gas used. A burner up to 20 inches in diameter should offer enough warmth to an area with 40,000 BTUs or more. Many of the portable gas fire pits use up to 60,000 BTU for a powerful heat. Any less than 40,000 BTUs mean you are basically investing in something more for decoration than heating purposes. Do I Need a Regulator for a Natural Gas Fire Pit? If a natural gas line runs to your fire pit, it will need to be appropriately regulated to supply the burner. How it is regulated will be up to the certified gas fitter you need to employ for the installation. It’s essential you work with a gas professional who can install a regulator based on all the variables. You may hear an annoying whistling sound if the supply is not regulated correctly, but more importantly too much pressure can be a major fire risk. A professional repair website further explains why you may need a regulator on a gas fire pit here. They refer to a natural gas grill, but the principles are the same for all natural gas outdoor appliances. Will Pea Gravel Explode in a Fire Pit? Many types of rock have the potential to explode, especially if they are porous or wet. Water and trapped air in a rock will turn into steam when placed near a fire, and the pressure may cause them to explode. Most experts would agree that you shouldn’t use porous rocks, like pea gravel, in your fire pit. If you’re looking for an alternative filler material, hard rocks, like granite, slate or marble, are better choices. They are much denser, and less likely to absorb water and break apart or explode. Flagstone and crushed stone are less expensive materials for your pit, and won’t retain moisture, unlike pea gravel. Can I Put Fire Glass Over Lava Rock? Lava rocks are generally much cheaper than fire glass. For deeper gas fire pits or fire bowls, there is no need to use fire glass in the part below the burner. Putting a layer of large lava rocks at the base of your bowl can insulate much of the warmth of the burner. Smaller lava rocks should be placed on the top lava layer to prevent fire glass from slipping through larger spaces between the rocks. Don’t, however, try adding extra ventilation holes to the fire bowl, as this can be a fire risk. How do You Increase the Flame of a Gas Fire Pit? Many gas fire pits will come with a built-in dial which controls the height of the flames. Another way to increase the flames is to provide a better airflow. Make sure there is adequate space between decorative logs, lava rocks or fire glass beads. Can Gas Fire Pits Run Continuously? If you want an eternal flame in your backyard, you’re going to need a gas fire pit which runs on natural gas. For all-night parties or longer cold days, they can provide continuous warmth. From a safety point of view, you should never leave a gas fire pit burning when unattended. Although there is little chance of the fire overheating, the naked flames can be a safety hazard. Young children or family pets should never be left unsupervised near one, or any source of naked flame.